Astrobiologists ooh and ahh over the possibility that oceans hidden beneath the ice of the Jovian moon Europa and the Saturnian moon Enceladus may harbor life — but let's not overlook Ganymede, an even bigger ice-covered moon of Jupiter. 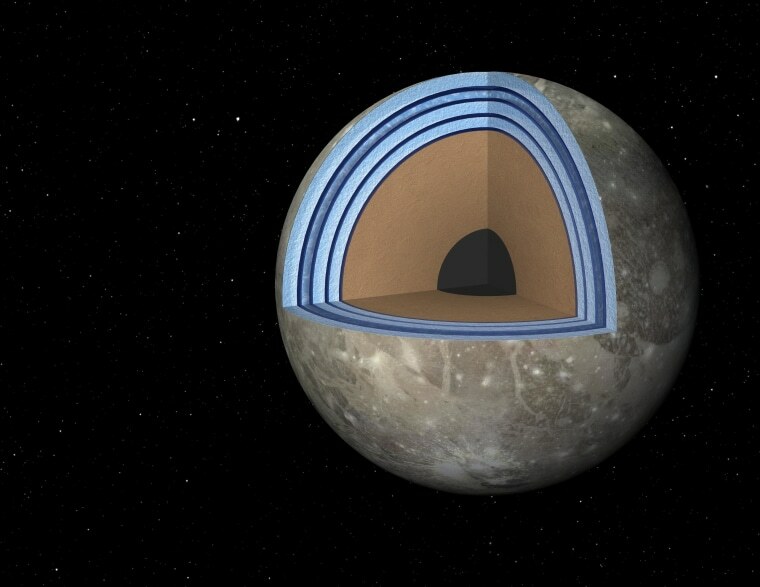 That's the upshot of a newly published theoretical study suggesting that Ganymede possesses a global "club sandwich" of water and ice, layered in such a way that marine organisms just might be able to find a foothold. "Ganymede's ocean might be organized like a Dagwood sandwich," Steve Vance of NASA's Jet Propulsion Laboratory said, in a statement that referred to the multi-tiered sandwich made famous by the "Blondie" comic strip. Vance is the lead author of the study on the club-sandwich hypothesis, which appears in the journal Planetary and Space Science. The study expands on a concept that Vance laid out last year as a potential scenario for a habitable ocean beneath Ganymede's ice. Over the decades, readings from NASA's Galileo mission have led scientists to conclude that Ganymede as well as Europa and yet another Jovian moon, Callisto, possess oceans of water beneath their surface ice. The presence of liquid water would normally get astrobiologists excited about the prospects for life, but not so much in Ganymede's case. Because of the moon's density distribution, researchers had assumed that the subsurface water was locked in at high pressure between a top and bottom layer of ice, with no possibility of getting nutrients from Ganymede's rocky core. Vance and his colleagues propose a more promising scenario, starting with the idea that the subsurface water is salty. Under the right conditions, salty water would sink below the lowest layer of ice, coming into contact with Ganymede's life-supporting rock. Computer modeling confirmed that salty water and ice could form a club-sandwich structure of alternating layers on Ganymede. The researchers can't say that's actually the way it is. But a European space mission called JUICE ("JUpiter ICy Moons Explorer") is targeted for launch in 2022, with the objective of getting a closer look at Ganymede, Europa and Callisto in the 2030s. That mission could provide enough data to determine whether Ganymede's club sandwich should stay on the astrobiology menu. In addition to Vance, the authors of "Ganymede's Internal Structure Including Thermodynamics of Magnesium Sulfate Oceans in Contact With Ice" include Mathieu Bouffard, Mathieu Choukroun and Christophe Sotin.